Did you know about the other products available at the farm? When you come to pick up your CSA distribution, we also have a limited supply of homemade maple syrup, and flowers. There is always something interesting and yummy at Middle Branch Farm! Through Hive at Your Home,we have adopted three hives at Middle Branch Farm, with another two or three to come in the next few weeks. The industrious insects will help with the pollination of the crops. What sorts of delicious goodies should spring produce share members be getting excited about? There will be a whole mix of produce for the kick-off of the spring share season tomorrow! Spring produce share members can expect a yummy supply of radishes, turnips, arugula, pac choi, mesclun mix, and garlic scallions. Happy Holidays from our family to yours. We had a successful 2014 and couldn’t be more ready to take on 2015. Jake and I have ordered potatoes already and are really excited with the new varieties. We are also going to try our hand at cut flowers. Dahlias to be more specific. Starting small of course! We would like to be in the greenhouse as early as February to start herbs like sage and rosemary and also an abundance of greens in hopes of a bountiful spring and early summer share. Would you like to see something we don’t offer, are you curious about certain varieties? Let us know! Now is the time. As far as CSA goes, our prices will remain the same AGAIN for 2015! Meat shares will only be available to those who purchase vegetable shares. Meat shares will include lamb next season. Vegetable shares will mostly be pre boxed and ready to pick up this coming year to make it more convenient for pack out and pick up. Half shares are available again! Please note: when purchasing via Paypal for more than one share, you must make separate payments for each share you intend to become a member of. Also in the notes section, include your pick up site of choice and information about payment if you are on a payment plan. Open House potluck with live music at the farm on Saturday June 22 12-4! The Spring share will start at Brookside on Tuesday June 11th and Saturday pick up at the farm June 15th. The 16 week summer share starts the week of July 8th, starting with pickup at the farm on that Monday..
Greetings from Middle Branch Farm! Another farming season has taken off! Our crew is hard at work, in the rain and sunshine transforming our fields around New Boston. We’ve put plenty of delicious crops into the ground already, from juicy Heirloom tomatoes to all sorts of peppers, to a thriving supply of potatoes, which should be ready in time for all your Fourth of July gatherings. 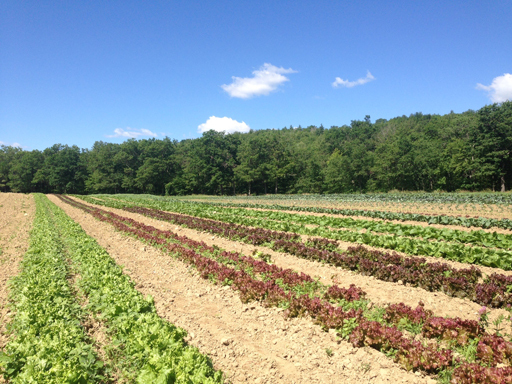 Tomorrow we begin harvesting for our spring share, the crops for which are already flourishing and ready to enjoy! We are looking forward to an abundant season and can’t wait to reconnect with all our wonderful share members. The Potluck to kick off the summer share will be held at the farm on Saturday June 23rd, from 12-4pm. The Spring share will start at Brookside on June 5th and Saturday pick up at the farm June 9th. The 16 week summer share will start July 2nd.